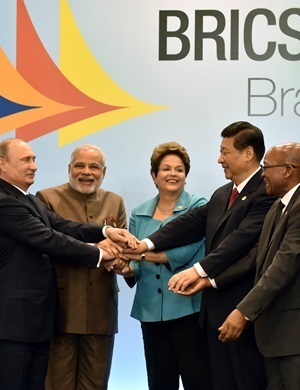 (L to R) Russia's President Vladimir Putin, India's Prime Minister Narendra Modi, Brazilian President Dilma Rousseff, China's President Xi Jinping and South Africa's President Jacob Zuma join their hands during Brics summit in Fortaleza, Brazil. The Development Bank of Southern Africa (DBSA), which largely funds municipal infrastructure, is on the fence about the New Development Bank planned by the Brics group of countries. In the DBSA’s annual report, released this week, CEO ­Patrick Dlamini noted that the new bank could be a threat as well as an opportunity – to a large extent, it will play in the same space as the DBSA. “Of concern is the ability of the New Development Bank to potentially provide preferential rates to clients due to its funding structures and financial strengths of the key founding countries,” wrote Dlamini. Speaking to City Press, however, he said that he “would be lying if he said this was a serious concern”. “At this point, they are still looking at their model for ­sub-sovereigns,” he said about the potential competitor for ­projects. “We need more partners,” he added. The DBSA this week put paid to the one specific concern raised by ratings agency Moody’s Investors Service – that its ­nonperforming loans might be rising due to overall economic ­stagnation. Instead, the bad loans on the DBSA’s books fell from 5.1% to 3.7%. The target is to keep these under 6%. The DBSA was one of five state-owned companies put on review for a possible credit rating downgrade by Moody’s last week. Dlamini said the DBSA was engaging with Moody’s and ­Futuregrowth Asset Management, which said it wouldn’t lend to the DBSA and five key state-owned companies. In another development, the DBSA faces trouble in its “rest of Africa” business. Zimbabwean media last week reported that the government of the neighbouring country is struggling to service a $206 million (R2.8 billion) loan advanced to it by the DBSA several years ago. The loan was for the rehabilitation of a major highway. “We are engaging with them [Zimbabwe],” said Dlamini. “They are faced with serious challenges regarding foreign currency. We will resolve that loan,” he said.